I savored dropping candle wax on the backs of the spiders creeping across my writing desk late at night. 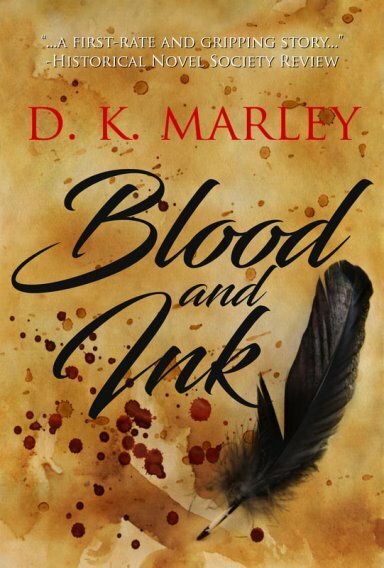 When I read the synopsis for Blood and Ink, I was very interested. I don’t read much set in Elizabethan time and I have never read anything about Shakespeare. William Shakespeare is known for his great plays. They have been studied, redone, and taught in schools. But what if William Shakespeare wasn’t the writer? Blood and Ink investigates this interesting “alternative history”. Christopher Marlowe is a playwright in the court of Queen Elizabeth. After a series of events, Marlowe is forced into exile and meets an unknown actor named William Shakespeare. The drama unfolds at an exciting pace and I poured through the book with ease. I adored the historical setting and the characters of the story. I’m not typically a fan of the Elizabethan period, but I was so intrigued by the controversy that surrounds Shakespeare’s works. I was very sympathetic to Marlowe’s character. My favorite part was Marley’s Q and A at the end of the novel where she discussed the very controversial topic and why she chose to write it. If you want to form your own opinion, you must read the book. I highly recommend it. Thank you D.K Marley for sending me a copy. I didn’t expect to enjoy it as much as I did. ñ Giveaway ends at 11:59pm EST on July 25th. You must be 18 or older to enter. ñ Giveaway is open INTERNATIONALLY. Thank you for the kind review and glad you enjoyed it!